Oh yes, the good ol' shopping mall food court... Let's see, Japanese teppanyaki, check. Suspect Chinese food, check. KFC, A&W, Timmies and some random salad bar, check. Unless we are talking about Crystal Mall, Aberdeen or Parker Place, most food courts follow the same game plan. Why not? There is something for everyone. However, that is beginning to change as more interesting food stalls are making an appearance. 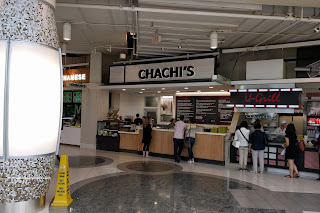 Recently, I was contacted by Chachi's (in Metrotown) to do a tasting. Well, it turned out to be a large group tasting as we practically took over the food court. 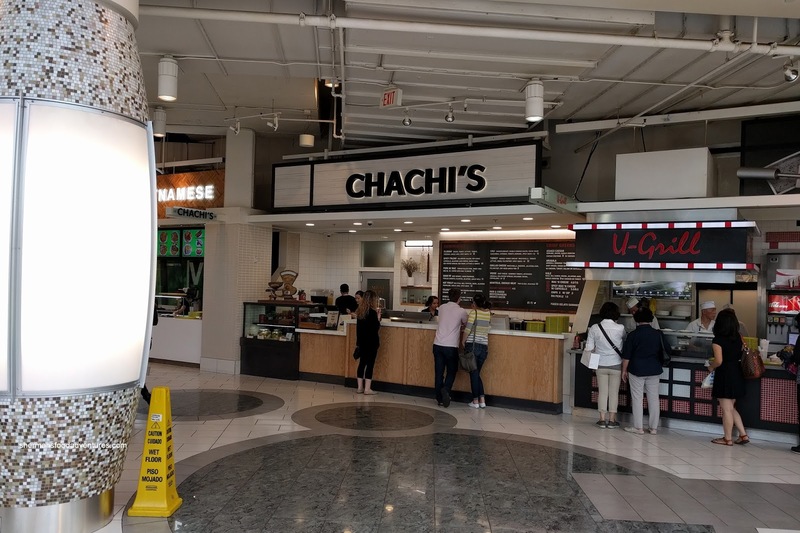 With an extensive menu of gourmet sandwiches, Chachi's attempts to offer something more interesting than the nearby Subway. 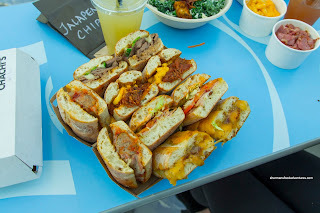 We ended up trying practically the whole menu with a selection of sandwiches including 3 of my favourites which included the Meatball, Philly Cheese Steak and Pulled Pork Mac n' Cheese. Stuffed with tender and well-seasoned meatballs, there was also a good amount of provolone in the meatball sandwich. I liked how the ciabatta was robust enough to stand up to the tomato sauce without being too hard or dense either. As much as I was skeptical about the steak in the Philly Cheesesteak, it turned out to be tender and natural in texture (rather than being over-tenderized). There was plenty of spiciness and salt for full impact. Although far too sweet, the pulled pork was moist and tender. The star of this sandwich was the creamy and cheesy Mac n' Cheese. The Clubbin' was essentially a turkey club highlighted by the garlic aioli and spicy mayo. It was decent, but pretty standard. I wasn't a huge fan of the Grilled Cheese as the amount of sweet fig chutney dominated the flavour profile. The next set of sammies included Cajun Chicken, Spicy Italian and Ham & Cheese (repeat of the Philly in between). I didn't find the Cajun Chicken to be overly spicy despite the visuals. The chicken was moist and tender though. I think the addition of lettuce, tomato, cheddar and mayo made it more of a regular sandwich as it watered down the impact. On the other hand, the Italian was super flavourful and spicy. Due to the combination of calabrese salami, capicollo, jalapeno jack cheese, garlic aioli and red pepper spread, there were layers of flavour that bordered on salty, but it was enjoyable nonetheless. As for the plain Ham & Cheese, I do believe it is on the menu purely to satisfy those who are less adventurous. It was, well... a ham & cheese sammie. I do not fault them for this one as I'm sure it is not a huge seller (probably for the kiddies too as it has safe flavours). 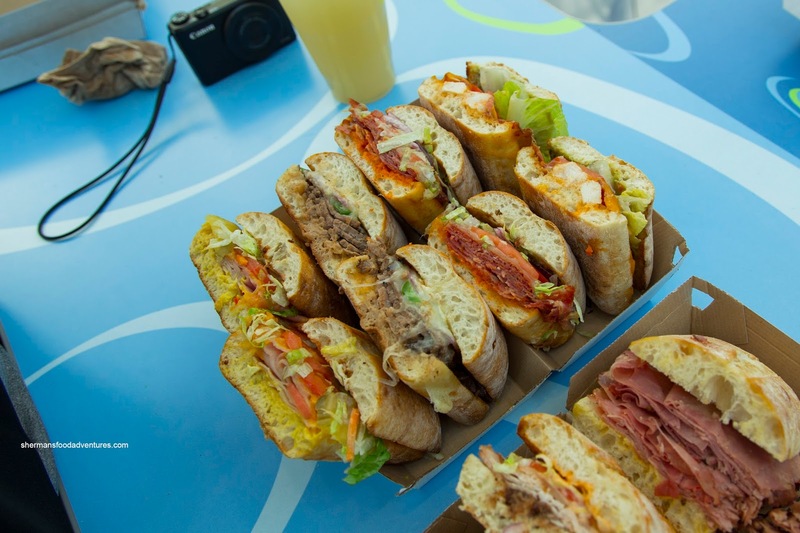 The last 3 sammies also included a repeat in the Cajun Chicken (on the bottom). On the top was something I didn't expect to like in the Montreal Smoked Meat. Sure, it can't compete with Estrella's or Dunn's, but for a food court smoked meat sandwich, it held it's own. There was enough salty meat to make an impact and the surprising amount of spicy mustard made this quite potent. 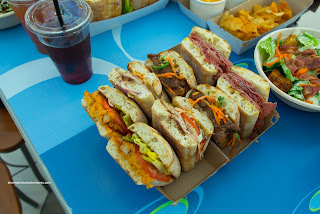 As for the Banh Mi, I laughed at it before I took a bite. But really, it wasn't bad. The tender beef brisket was nicely sauced with a sweet (maybe a bit too much) and aromatic sauce. It could've used a bit more pickled carrots to balance off the sweetness. Predictably average, the Smoked Turkey sandwich is probably on the menu for the same reason the ham & cheese is on the menu. Onto some salads, we tried the Kale, Arugula and Asiago Caesar. 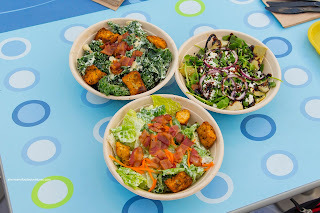 I liked the Kale the best with its combination of dill ranch, bacon, jalapeno jack and garlic crostini. There was just enough dressing for some creaminess while the bacon and cheese added some saltiness. Not sure of the crostinis though as they were pretty big and very crunchy (made from the ciabatta). I wasn't a huge fan of the Arugula as it seemed to be less fulfilling. I guess due to the lightness of the greens, it didn't feel substantial. As for the Caesar, it was pretty standard except for the addition of asiago dressing and bacon. It was rather creamy and salty with even more salt from the bacon. It was decent though. Probably the best thing on the menu was actually as side - the Mac n' Cheese. As mentioned early, it was super creamy and cheesy while the pasta was surprisingly not soft. There was plenty of saltiness to go with the cheese flavour. Add in the capicola and the mac n' cheese became spicy and meaty. 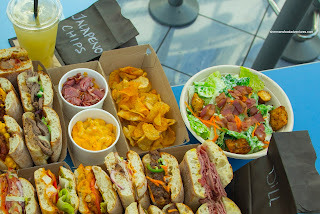 They also had 3 types of Kettle Chips available too including Salt, Dill and Jalapeno. These were crunchy and not overly greasy. I liked the dill the best with its creamy tang. After trying nearly the entire menu, it was pretty clear that the more "interesting" items were tasty and fulfilling. The rest of the more standard items were only there to satisfy the less adventurous. For me personally, I would pay the slight extra cost for the sandwiches I liked most rather than defaulting to Subway. What was the quality of the bread like? Are there any other bread options available besides what appears to be ciabatta buns? @Steve The bread is good. Only ciabatta I believe. I liked how the bread was firm enough to hold everything, yet it wasn't too dry nor dense either. I really love Chachi's, especially the Mac n Cheese. I wish I knew where they got their ciabatta buns from, they're the perfect sandwich bun. The Montreal Smoked meat is very good too. I do find them a bit pricey but the quality is so far superior to Subways.